The Kobe 8 is still dishing out new colorways with the next colorway due out in October. Known as the "Pit Viper" edition, this Nike Kobe 8 System comes in a purple dynasty, green glow and raspberry red colorway. 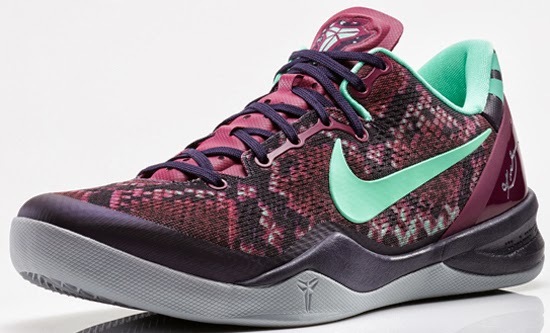 Featuring a purple based upper with a pit viper snake design throughout. Green glow accents the Swoosh on the sides as well as the sockliner and parts of the back heel. Raspberry red accents and a grey outsole finish these off. A general release, look out for these at select Nike accounts worldwide on Saturday, October 5th, 2013. Retail is set at, $140.